Daniel Ulbricht is a principal dancer with the New York City Ballet. He is also the founder and director of Stars of American Ballet a touring ensemble “devoted to presenting high caliber dance performances, as well as education and outreach programs.” The company which had performed in Portugal earlier in the week presented two programs in Santa Fe – on August 3 and 4. I attended the second of the two. Prior to the show Mr Ulbricht gave an informal talk about his group and the program which proved an informative and pleasant introduction to both his company and to the pieces that were to be performed. The program is reproduced below. The order of the second half of the bill was rearranged, but otherwise the program is an accurate record of what was performed. 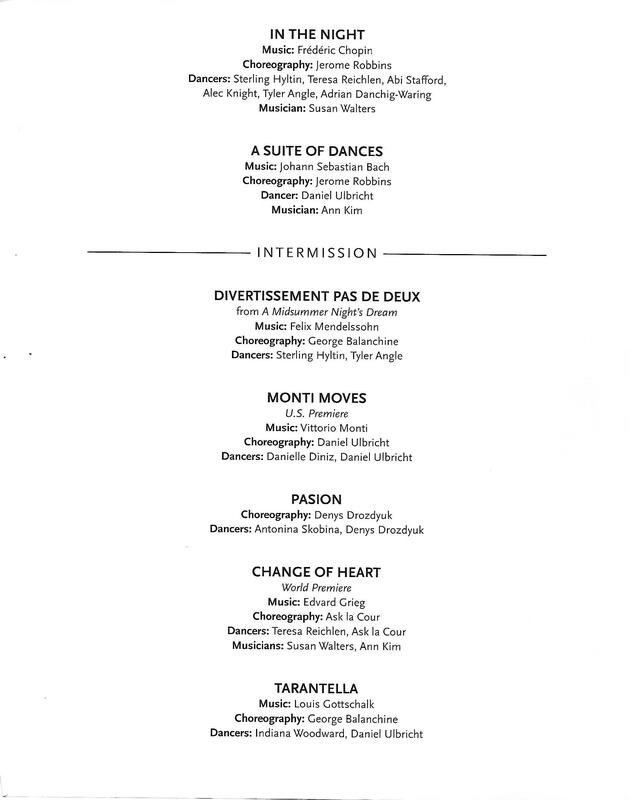 The music that the dances were set to is given on the program, except for Passion which was set the first few minutes of Carl Orff’s Carmina Burana. The combination a flamenco style dance set to the music of a 20th century German composer seems odd, but it worked very well. Ballet is an art form that, unlike instrumental music and opera, does not depend on the composition of new music that will attract an audience. It’s nice if such music appears, but new and creative choreography will sustain a dance that has any kind of music that suitable for the purpose of a talented dance master. Mr Ulbricht’s dancers are almost all principals with the New York City Ballet. And all of them, regardless of where they appear, are highly skilled artists who perform at the highest level a viewer could require. The sold out house (The Lensic Theater) gave them a rapturous reception that was well deserved. If the company comes your way buy a ticket and enjoy dance at the elite level. This show was another reason why Santa Fe has become the Summer music capital of the USA.